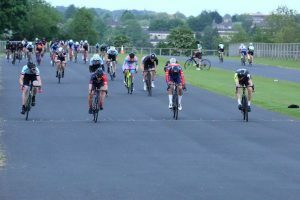 It was a calm evening at Odd Down, and the conditions contributed to the first bunch sprint of the series in the men’s 2/3 race as Kieran Blay (TAAP Cervelo) took the win ahead of Nathan Hallett of Latchem Sunwise. Unusually, the big teams were not able to leverage their numbers to split the race, with Bristol RC’s James Phillips picking up the consolation of third place in the sprint to extend his overall series lead. Despite no solid move being established throughout the race, that was not for the want of trying, with Luke Barfoot (Tri UK) launching the first move, with Tom Sharp (Bristol RC), Andrew Kirby (VC St Raphael) and Jake Hollins visibly active throughout. But with the number of successful breakaways over the past few weeks, nobody wanted to miss out and as a result the large field provided many fresh legs to bring the group back to the escapees. This sustained pace resulted in the race averaging nearly 45kph – the highest average pace on record for a race at the venue. This sustained speed was what made it nearly impossible for a group to get away, but it did not stop the main protagonists for the overall series standings rising towards the top of the order. Hallett’s second place sees him move up to become series leader Phillip’s closest challenger, with the leader’s teammate the next rider back in third ahead of Hollins. The 4th cat race was also driven at a high pace, but unlike the 2/3 race, this was enough to prise the group to pieces under pressure from a front group of five riders. Joel Thomas (University of Bath CC), Will Crudgington and Frederick Webb were putting in a large amount of the early pace-making and as they finally started to create definitive space to the group behind they were joined by Martin MacDonald (Bath CC) and Simon Hunt. The five were working together well, pursued by an ever decreasing peloton as the corners took their toll on the riders near the back of the group. 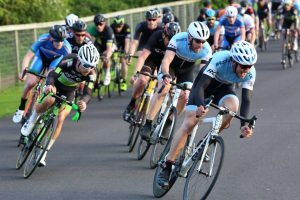 As the race entered it’s final stages, and the chasing group was also reduced to five riders, it was clear that the win would come from the aggressors. Crudgington took the sprint ahead of Webb as the group stayed together all the way to the finish. MacDonald was the next rider across the line to round out the podium. With the Elite and 1st category riders back in play again next week, will the likes of Luke Nolan (Latchem Sunwise) be able to put themselves back in the mix? 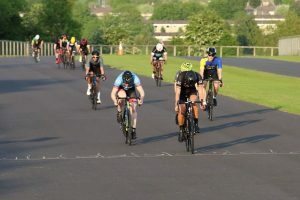 The men’s results saw Bristol RC retake the team series lead from Avid Sport, who will have the chance to respond during the women’s races on Thursday.